tado° Smart Thermostats make your home more comfortable. Now your heating system can adapt to your life whilst becoming more efficient than ever before. The unique features of the Smart Climate Assistant enable you to save up to 31% on your heating bill. Completely automatically. tado° uses your phone’s location to control your heating. It saves when everyone is away and pre-heats when it detects the first person returning home. tado° saves energy and heating costs. tado° lets you know how warm your home is, when the heating is on and gives you control from wherever you are. tado° automatically adapts your heating to the current weather in order to heat most efficiently. The Smart Radiator Thermostat uses your phone’s location to control a room radiator. It turns the heating down when no one is home and starts to pre-heat when it detects the first person returning. 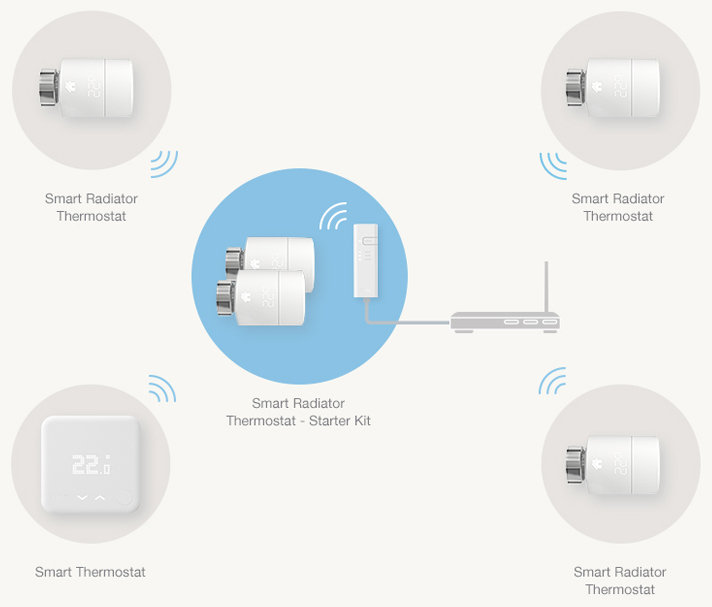 If you already have a Smart Radiator Thermostat - Starter Kit or a Smart Thermostat - Starter Kit (v3) with a Internet Bridge then you can use several Smart Radiator Thermostats to control multiple radiators and zones independently from one another.